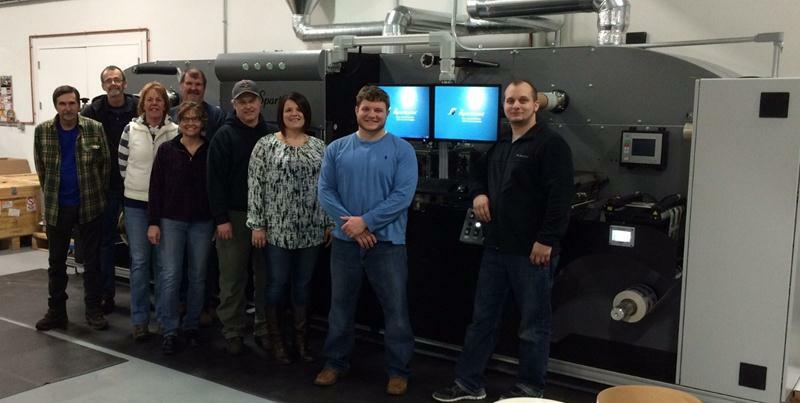 February 23, 2015 – Digital label converter, ImageTek Labels, headquartered in Springfield, Vermont, installed their first Spartanics Semi-Rotary Laser Die Cutting System. The Spartanics Semi-Rotary Laser Die Cutting System is a complete label finishing solution that is equipped with a myriad of converting options to deliver unsurpassed label finishing quality and flexibility. ImageTek Labels is a top quality label converter that utilizes top of the line digital printing and finishing equipment to quickly produce high quality labels with durable inks and materials. Labels produced by ImageTek Labels can survive the most extreme environments and adhere to a variety of substrates. The Spartanics Semi-Rotary Laser Die Cutting System installed at ImageTek Labels comes fully loaded with a rotary hot stamping system, a dual sided laminator, a 400 Watt high-speed laser die cutting station with a 350 mm working field, a combination semi-rotary / full rotary die cutting station, a full varnish flexo station, a coil parts extraction unit, a rotary sheeting station and comes with the Spartanics Fastline Laser Cutting Software. This unit also has the ability to operate as a roll to roll or roll to sheet system. ”We were excited to show ImageTek that we are more than a laser cutting solutions provider, and we feel that this system will allow them to continue offering their customers flexibility and fast job turnaround,” says Mike Bacon, Spartanics VP of Sales and Marketing. This is an offline Semi-Rotary Laser Die Cutting Finishing solution that was purchased and installed to complement the EFI 4950LX UV LED Series Digital Printer that was installed at ImageTek Labels late last year. Rolling Meadows, Illinois, USA-headquartered Spartanics specializes in tightly integrating advanced software engineering with sophisticated handling systems to manufacture best-in-class die cutting machinery, laser cutting machine technology, as well as, screen printing systems and other equipment for fabricating products made from flat stock materials. Its worldwide service organization uses state-of-the-art virtual service technician technology and also maintains offices and spare parts in Europe. For all sales and product inquiries please contact us!